Recruiting the right people is key for Fuller’s. Here at Fuller’s, we have a vision for our pubs and team members. We want to create and operate the most stylish pubs and hotels whilst brewing and supplying Britain’s most coveted premium brands for discerning customers. We want to make sure that we deliver a distinctive customer experience, grow our business to enhance our premium position, continue improving on our already strong reputation and have excellent staff and development opportunities to achieve all this. Fuller’s is full of great opportunities to enhance your career and learn great skills. Callum Melhuish, one of the 71 chef apprentices who to join Fuller’s last year, started off his passion at school by making Swiss rolls, and now, is a semi-finalist for the Torq D’or competition along with being entered into the Fuller’s Chef of the Year 2018 under 25's competition. Fuller’s is the place to be for chef apprentices, we have partnerships with various Universities and Colleges, including the University of West London. These programmes are designed to fully develop you into becoming a well-rounded chef who is adept in working in any demanding kitchen. Apprentices gain a college education as well as working in a real-life kitchen, as Callum states ‘there is nothing greater than real life experience’. The Fuller’s Graduate scheme, which is now in its 8th year has seen young people supported and motivated into performing amazing things for Fuller’s. Hayley Marlor, now part of the brewing team, worked with Marble Brewery and created a saison beer called Matariki which is now being sold in Waitrose, as part of the Fuller’s and Friends initiative. Hayley was named one of the ‘top five female brewers you need to know about right now’. 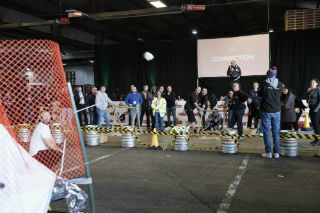 The current graduate intake took part in the Times Graduate Challenge, rolling a 101 kg barrel 10 miles for charity and took part in a challenge day against other companies (read more about the barrel roll here). The Times Graduate Challenge, now in its 11th year, had over 30 teams taking part and everyone at Fuller’s was delighted when our graduates won the Times Graduate Challenge 2017-18. We believe in training here at Fuller’s, in 2017 over 15,000 training days were undertaken with 11 development programmes in place, which help create career paths from entry level to director. We have had the huge honour of being recognised at the Employer Brand Management Awards. We were awarded Bronze prize for “Best Employee Experience”. We are proud that Fuller’s has been recognised as a great company to work for, recruiting the best talent and having a strong welcoming family culture that keeps employees motivated to producing their best at Fuller’s. Fuller’s doesn’t only make great London Pride, but takes great pride in employees, their journeys, experiences and growth. This was our first-year taking part in the event and to be given such prestigious recognition is brilliant. Fuller’s has been an independent and family-run business for 173 years and that longevity doesn’t come from resting on our laurels. Fuller’s will continue to improve our offering to make sure we stay as the amazing place we know it is and making sure next year we get gold. Fuller’s doesn’t only make great London Pride, but takes great pride in employees, their journeys, experiences and growth.